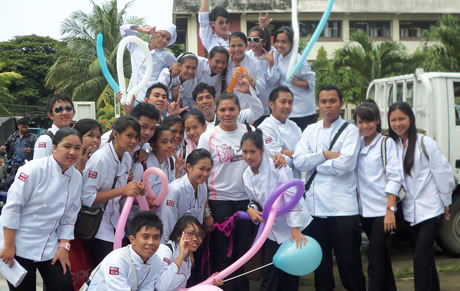 The young chefs of the Western Mindanao State University (WMSU) are in their traditional toques coupled with double-breasted jackets, all clad in white for the Chefs on Parade 2010. The said activity was celebrated by the Hotel and Restaurant Management (HRM) Department of the College of Home Economics, WMSU from September 29 to October 2, 2010 with the theme “Learning and Honing Skills for Future Hoteliers and Restaurateurs”. Several activities were lined up for the occasion wherein some 250 HRM students competed in the different categories. The students were very energetic when the four-day event kicked off with a motorcade around the city followed by a brunch at the WMSU grounds. In the afternoon, the event was formally opened and different contests were held. The first event was the On-the-spot Formal Dinner Setup, followed by Table Skirting and Centerpiece Making. Both contests were won by the second year section B (II-B) HRM students. On the second day, there was a Napkin-Folding contest. The task was to fold as many table napkins for a period of one minute and the participants would have to identify the name of their napkin folds. The fastest and most efficient napkin folder came from the third year section A group (III-A). Then there was Waiter’s Relay afterwards wherein students would have to pass through a lot of chairs aligned in a zigzag position to serve the orders in one table. The III-B students won for the said contest. In the afternoon, the next event was the Market Basket won by the II-B students, followed by the Flower Arrangement cupped by II-C students. The last game for the day was the Flairtending Competition which was won by the students of III-B. While the third day was devoted to the culminating activity of the third year students, on the last day, there was a Baking Lesson with Chef Ina. The winners were given trophies and the runners-up were given certificates. “The HRM Department is actually eyeing for students who can participate in the regional contests at the General Santos City during the Tuna Festival. This will give the students the chance to show their skills in the field where they are good at”, she added. As early as now, the Department wants to train the students in their respective skills and to teach them the guidelines especially in table arrangement.